Day 370 / Hat 370: Black, trucker-style cap with mesh back and foam front. Allover print detail of skull and crossbones design in gray on front panel and bill. Additional detail includes Stylized glow-in-the-dark skull screenprint on front and the words "Treasure Island, Las Vegas" accompanied by the lowercase "ti" logo of the Treasure Island Hotel and Casino. Purchased for the Project by the Bride at the Sirens Cove Shoppe at TI a few minutes before midnight this morning. I tried to capture the glow-in-the-darkness in the photo at right. I'm sure I'm not the first person who has tried to take a selfie in a bathroom at the Wynn Hotel -- but I may be the first person to do it in total darkness. The Siren Bride gets the hat-tip, the TI merchandise mix the assist. This is one thing that won't be staying in Vegas. 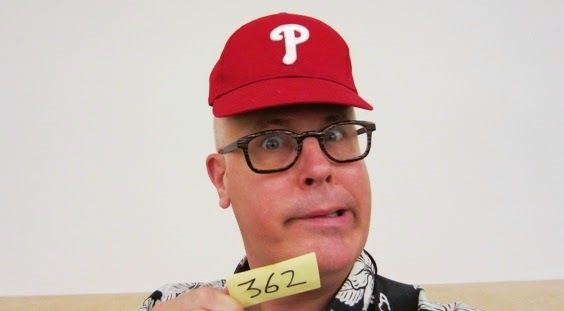 Day 369 / Hat 369: Baseball-style cap with black back and bill, white front panel. 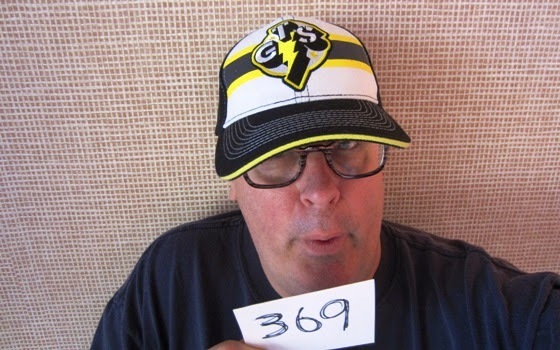 Details include yellow contrast tipping on bill, yellow screen-printed star and lightning bolt emblem on wearer's left side of hat black and yellow horizontal stripe on front panel with embroidered black, white and yellow logo that reads "GTS" with a vertical lightning bolt and two stars. Additional details include interior label that reads "WWE Authentic" on one side and "TM & (C) WWE 2012, 100% cotton, made in China." and interior seam taping printed with WWE Authentic." "OK, so [it refers to] a wrestler named CM Punk and he was the second most over guy in the [WWE] until a couple months ago [when] he abruptly walked away from the job leaving a big hole to fill and has yet to return. GTS refers to his finishing movie which is Go To Sleep where be basically nails his opponent in the head with his knee. He kinda made it cool to watch wrestling again and is a cult hero after rising the ranks of the independents to become WWE champ. ... So he is a big underdog in a lot of people's eyes. I asked for it as a birthday or Christmas gift [because] I wanted to support him. Of course he left and WWE is starting to discount his merchandise and [he] may never return. That hat was probably one of the last pieces they ever produced for him." 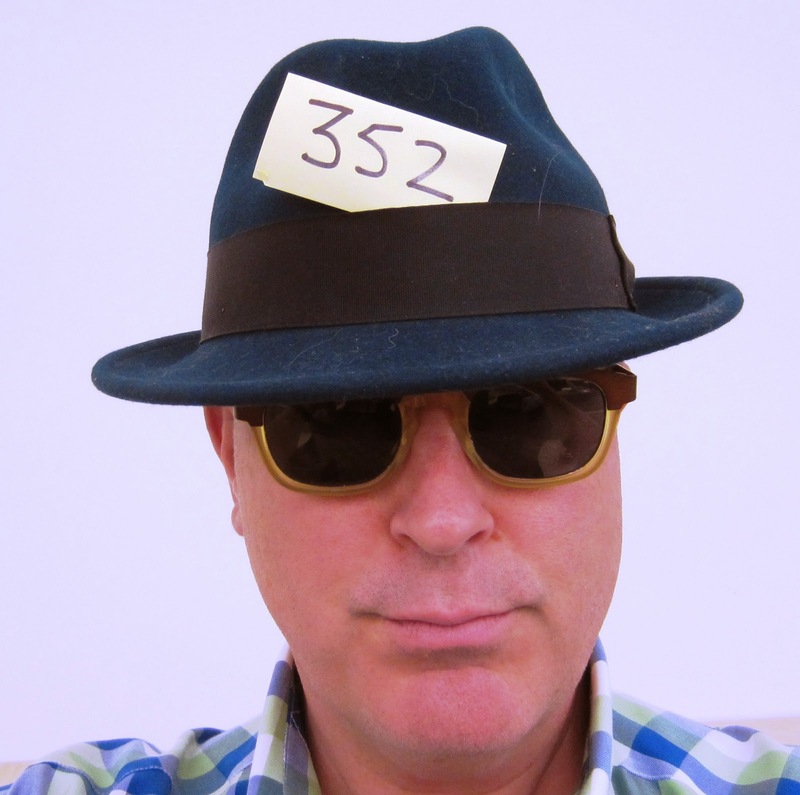 Brian says he did, indeed, receive the hat as a birthday gift from his wife (that'd be Ruth O'Neill) last year. According to a cursory glance at Mr. Punk's Wikipedia entry, it appears his other name is Phillip Jack Brooks and he holds the distinction of "longest reigning WWE Champion of the modern era," a reign that lasted, just in case you were wondering, 434 days. Day 368 / Hat 368: Baseball-style cap with red and green floral design (they look like roses) against a white background on the crown and red gingham pattern on bill and crown button. 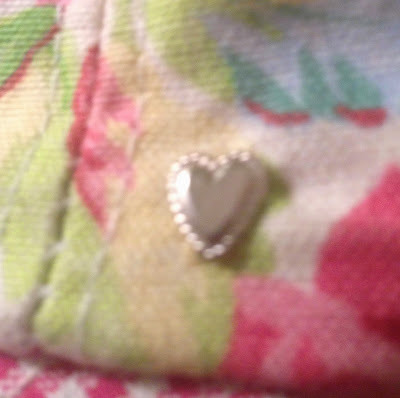 Additional detail includes tiny, silver-colored, heart-shaped metal embellishment on the crown just above where it meets the brim on the wearer's left. Interior label reads: "Annie Sumang." Plucked for an early morning edition of the Project from the MRBOH. Day 367 / Hat 367: Graphite gray fedora with two-inch brim, 5-inch crown and two-tone (gray and brown) grosgrain hatband and bow detail. Interior tag reads: "Bailey of Hollywood," fabrication tag reads "95%, 5% cashmere, X-LARGE, made in U.S.A.," and hangtag gives the name of the style as "Roebling." Here's a little blurb about the Roebling from hats.com: "The Roebling from the Bailey of Hollywood Cashlux collection is a modern day fedora. This hat is made of the most exquisite wool felt blended with cashmere fibers for the look and feel of fur felt. Proudly crafted in the USA and designed Victor Osborne, and is exclusive to Bailey of Hollywood." What I couldn't find anywhere (at least in my cursory search of the interwebs) was what the style name "Roebling" is a reference to. Could it be an homage to German-born American civil engineer John A. Roebling? Alive from 1806 to 1869 (the Golden Age of Hats), this gent was known for his wire rope suspension bridge designs -- and is famous, at least in certain circles, for his design of the Brooklyn Bridge in particular. And that's what fedora-wearing hispters have to cross to get from Brooklyn to Manhattan! Unfortunately I have no answer. Sorry to leave you in ... suspense. 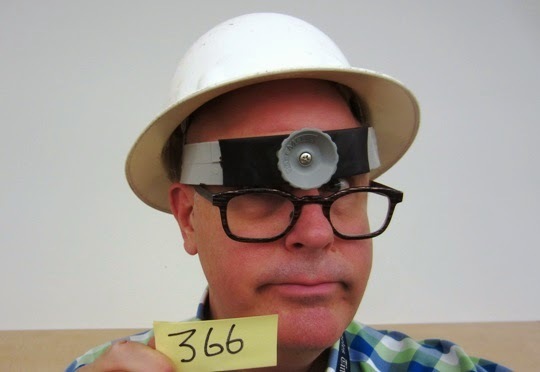 Graciously loaned to the Project by the kind PR folks at The Headwear Association who collectively get today's hat-tip. Day 366 / Hat 366: White plastic hard hat with a slightly pith-helmet-like silhouette that includes 1 1/2-inch brim all the way around, gray plastic and fabric interior head harness and an adjustable gray sizing knob emblazoned with the name Fibre-Metal. According to the brand's website (it's apparently a division of Honeywell), this is an E-1 Full Brim and I think the all-the-way-around brim is what gives this just a tad more flair. "The exclusive smooth crown design contains a technically advanced suspension with eight load bearing points to stabilize and balance the hard hat during everyday wear. On impact, the SuperEight impact energy control system dissipates force by reducing it to smaller increments and spreading it over a greater area. Full brim adds an extra margin of protection from hazardous sun rays and hazardous substances falling onto the neck and shoulders." Plucked for the Project from the MRBOH. Day 365 / Hat 365: Red polyester Flash cowl with yellow lightning bolt earpiece detail and red string that ties in the back. Graciously loaned to the Project by Brian Razzano. Brian passed off the cowl yesterday at a barbecue in Sherman Oaks. When he did so he asked: "Does a cowl count?" In my world a cowl most certainly does count (hats and headgear folks!) and I couldn't think of a better piece with which to mark full year of millinery madness. Yes, that's right, it's been a full cycle around the sun since I embarked on my frivolous pursuit of sporting a different lid every day for 500 days. While it seemed like a daunting challenge when I stood in our kitchen last Memorial Day to snap the first hat in the series, it has kind of gone by in a flash -- thanks to all the generous contributions of family and friends. With any luck, we'll make it all the way to 500. But back to the Flash for a minute. Brian, who says he had the hat because he was thinking about making a short film about a guy who finds Flash's ring (that's where the DC superhero keeps his costume),. 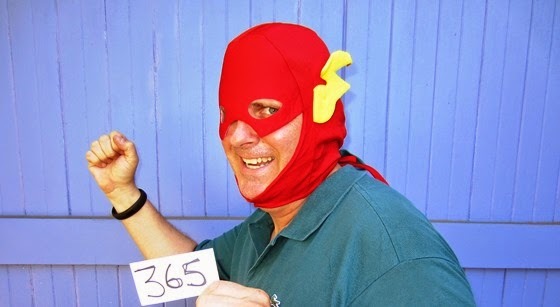 He probably didn't realize that Barry Allen and his Scarlet Speedster alter-ego was actually my favorite character growing up (I was a huge comic book geek). Of course Barry Allen wasn't the only (or even the first) incarnation of the Crimson Comet, a DC Comics universe character that was created by writer Gardner Fox and artist Harry Lampert and first appeared in Flash Comics #1 in January 1940 (the Jay Garrick version, easily recognized by his much different uniform that actually includes a winged helmet a la the Greek god Hermes. I didn't realize (until I got Googlin' today) that the Barry Allen version is is "generally considered the first hero of the Silver Age of comic book," (so sayeth Wikipedia, anyway). The hat-tip to Brian Razzano, and a sincere thanks to all those whose loaned lids got me a spin through the calendar year. Now it's time to tiue my running shoes on real tight and sprint to the end. Day 364 / Hat 364: Pink cotton cap with butterfly, doll face and flower appliques on front. Additional details include light pink edge with white polka dots, three embroidered daisies and the word "Lalaloopsy" embroidered in white cursive script on the bill. Interior label reads: "Lalaloopsy, sew magical! sew cute!" on one side and "manufactured by Berkshire Fashions , Inc., made in China." Fabrication tag reads: "100% cotton, exclusive of decoration." Plucked from the extremely bountiful MRBOH. Day 363 / Hat 363: White polyester microfiber (I think) cap with white ear nubbies and Velcro-closure chinstrap. Cartoon Network "CN" logo and the words "Cartoon Network" embroidered on back in gray. 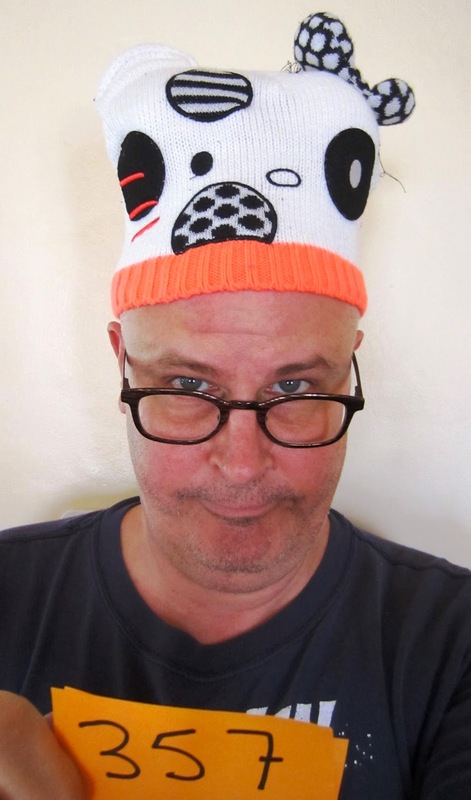 I ran across this hat in the eight-year-cleaning cycle currently underway in the Garlodge and couldn't believe that I hadn't yet included it in the Project but I looked high and low and it doesn't appear I have. If it looks familiar it's because one of my Facebook profile pictures includes the hat - and it's always generted lot sof comments every time I cycle it through. Network series "Adventure Time" created by Pendleton Ward, which aired its first episode on April 5, 2010, (so sayeth Wikipedia, at any rate). The character that wears this distinctive headgear is a chap named Finn. The show's website says this about him: "Finn is a silly kid who wants to become a great hero one day. He might not look too tough, but if there's evil around, he'll slay it. That's his deal." 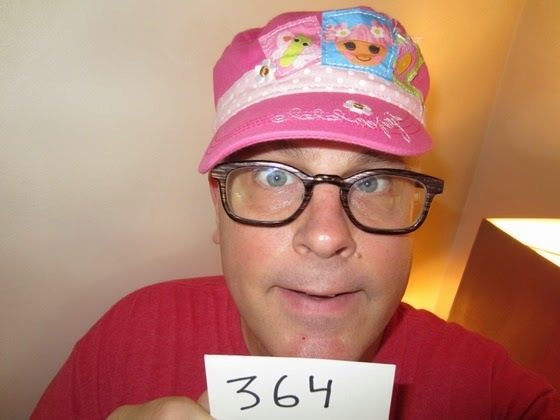 Oh, and the Facebook profile photo of me wearing the hat at some undetermined point in the past is included above. 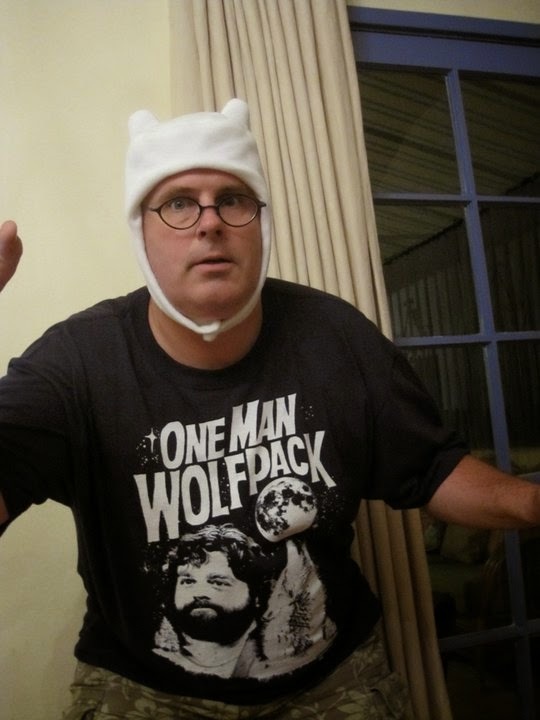 I think it captures the spirit of "Adventure Time" though I had no idea at the time. PC 360: Two Points Ohhhh! Day 362 / Hat 362: Red baseball cap with a stylized letter P in white embroidery on front. Additional details include black contrast under brim and in sweatband, Team MLB logo in red, white and blue embroidery on left, blue button on crown and adjustable size strap. Interior tag reads: "Team MLB, made in Bangladesh" on left side and: "by OC Sports, official licensee of MLB, Youth" on righ. 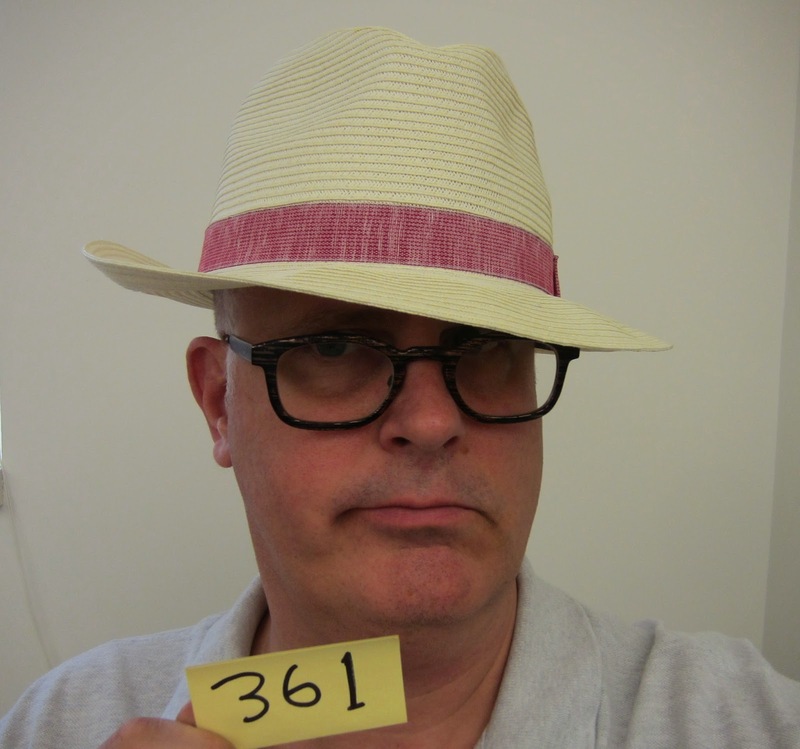 The "youth" part refers to the size as this hat was plucked from the MRBOH and it belongs to Marilyn's son Javier who has already graciously (if unwittingly) provided a hat trick of hats to the Project (including one of my all-time favorites, the googly-eyed bucket hat worn for PC 336). And Marilyn tells me it's part of nine-year-old dude man's baseball uniform (she has a cute photo at her desk of Javier swinging for the fences in his full ensemble) and his youth baseball team is called the Phillies -- same as that MLB team from Philadelphia. 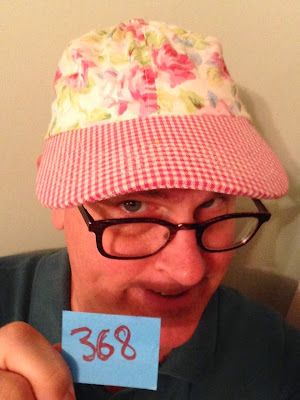 Day 361 / Hat 361: Ivory-colored pinch-front braided-paper fedora with red and white grosgrain hatband detail with bow and matching interior sweatband. Brim measures 2 inches, crown height is 5 inches. Interior label reads: "Broner" and interior label reads: "100% paper, men's L, made in China." Another loaner from The Headwear Association's sample closet, I was able to find this exact item (88-149) in Broner's Spring/Summer 2014 catalog, which calls this particular style "Doo-Wop." In addition to "ivory," this particular style is also offered in "pecan" and "slate." 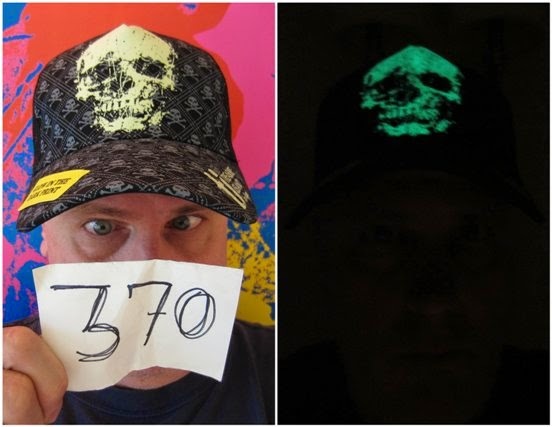 Day 360 / Hat 360: Definitely skewing more toward the headgear than traditional hat (I'm pointing that out at the front end s Dora doesn't have to), this is essentially a pair of battery-powered plastic light-up "Maleficent" horns attached to a wide plastic headband shaped skull clamp (Or maybe it just feels like a skull clamp on my head.) Raised tone-on-tone plastic lettering on battery cover reads: "2014 Jakks, Malibu, CA, [made in] China." And if you think the horn-sportin' Tschorn looks familiar, you're not imagining things. I slapped a paper pair upon my pate back at PC 77: Throwing Horns after attending the D23 Expo in Anaheim last August. 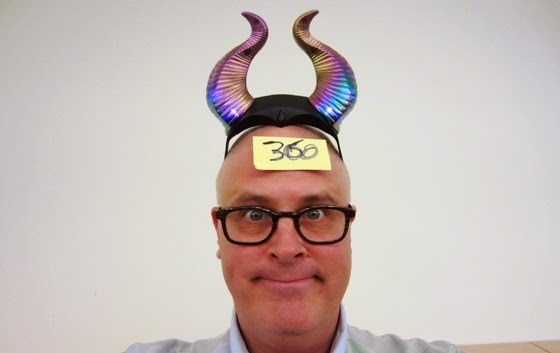 Which means now if, if someone asks to borrow a pair of horns, I can respond with: "Paper or plastic?" 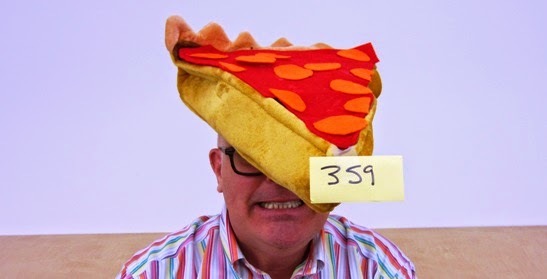 Day 359 / Hat 359: Decorative plush novelty hat in the shape of a giant triangular slice of deep-dish pepperoni pizza. The red felt "tomato sauce" and orange felt "pepperoni slices" were after-market modifications added to the hat by yours truly, with 100% wool felt sourced from Blick Art Supplies and attached with the world's oldest bottle of Elmer's Glue-All. Were you to remove a pepperoni round you might find that it is exactly the same size and shape as the top of a traditional shot glass. Even though it looks like an art project by a four-year-old jacked up on caffeine (which, let's face it, it essentially is) this addition to the Project was in the works for a long time. It was very, very graciously ordered and sent from Amazon some weeks back by Emily O'Neill -- an early and devoted fan of Project Cubbins -- whom I cajoled into contributing a piece of headgear to the cause. Since there have been hundreds and hundreds of hats to date, Emily didn't realize that a Beistle Pumpkin Pie Hat (one size fits most) had already been featured in the Project way back at PC 178 "Life of Pie" (to be honest, I needed to do a quick search myself). Sinvce one of my self-imposed rules is "no duplicates," I found myself in a pickle (which reminds me - I bet there's a pickle hat out there somewhere). I explained the predicament to the Bride who, with her usual lightning-fast reflexes, said "Why not make it into a slice of pizza?" A brilliant idea, yes, but for a long time I was convinced that in addition to removing the dollop of whip cream and adding appropriate toppings, I could modify this thing to actually serves as a tray/holder for a 12-inch on the side specially baked slice of honest-to-goodness pizza. (at one point I had approached the Test Kitchen here at work about helping me through the dough). Yes, I was hoping to eat my hat. This is a long way of saying today's hat-tip - accompanied by a very deep and enthusiastic renaissance faire bow -- goes to the OG Home Slice Emily O'Neill for getting a piece of the Project Cubbins action! 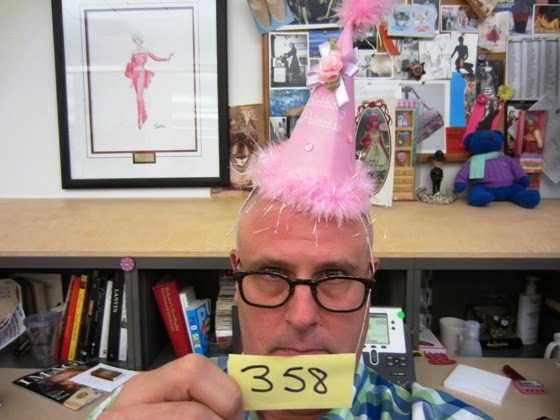 Day 358 / Hat 358: Pink conical plastic cap printed with the words "Birthday Princess" on front. 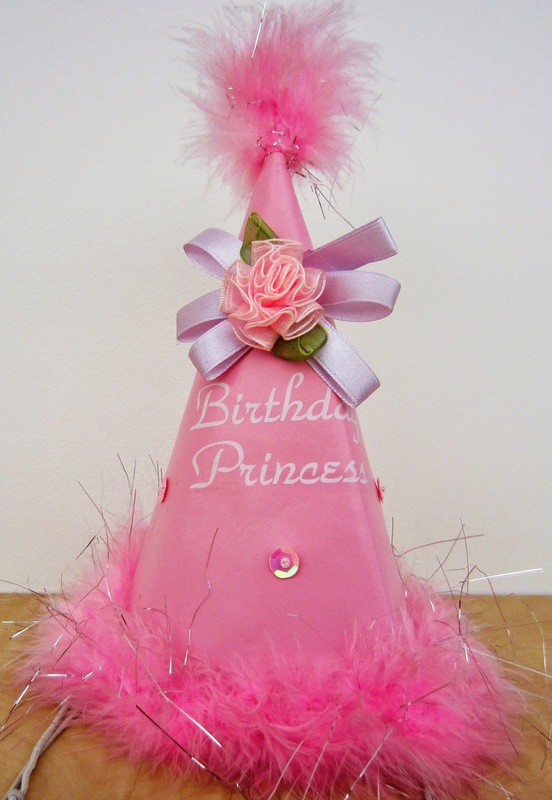 Additional details include pink feather trim and top fluff, elastic chin strap, and pink folded fabric rose and bow detail. Interior cloth tag reads: "Little Day Dreamers by elope" on one side and "hand made in China, spot clean only." Interior paper tag reads: "95% PVC, 5% other." I've been ferrying this hat, from the MRBOH back and forth from home waiting for the appropriate birthday to pop up on my social media radar. When I saw on the Facebook that it was Cameron Silver's birthday today, I took it as a sign from the hat gods that it was time to plop this bad boy atop my balding pate and preserve it photographically on behalf of the Project. The hat-tip to Marilyn -- and a symbolic assist (not to mention a "HAPPY BIRTHDAY" shoutout) to the birthday boy, CS. Day 357 / Hat 357: White knit Hello Kitty cap with orange rib-knit edge detail and assorted black and white applique embellishments that form a kinda/sorta face. Additional details include stylized whiskers in red embroidery, a puffy black bow tie with white polka dots affixed near the left ear and black, cursive embroidery on back that reads: "Hello Kitty." Plucked for the Project from the MRBOH, it's the second HK-themed hat I've featured (the first was PC 339 - also graciously on loan from my co-wporker Marilyn Ruiz). And no, it doesn't have that kind of vertical height all by itself, I had to stuff this lid to get the details to show a little better. And in case anyone's keeping track (I am) this marks the 13th piece of headgear plucked from the MRBOH - and I doubt I'm even halfway through it. 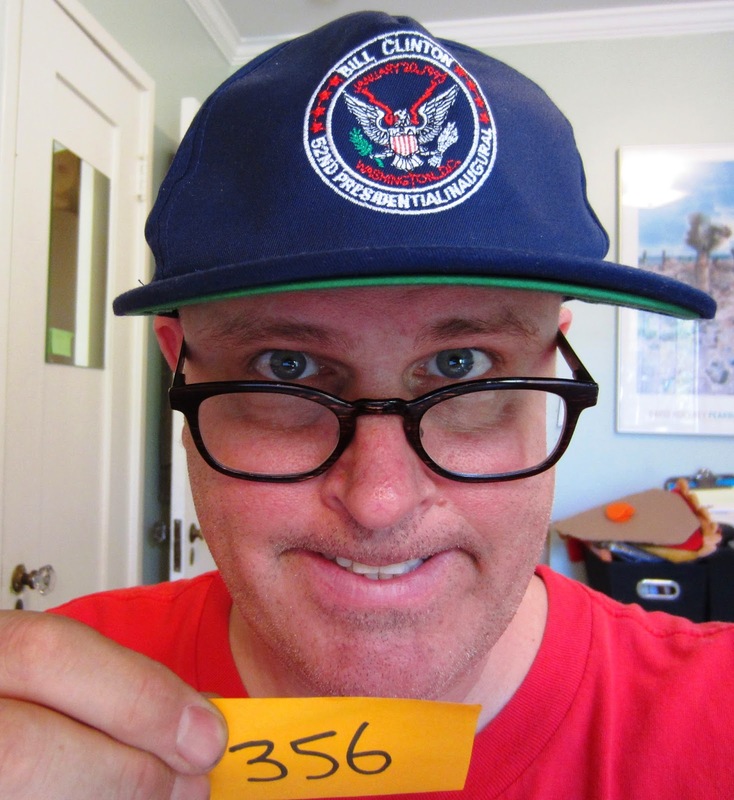 Day 356 / Hat 356: Navy blue, baseball-style cap with green under-bill section and multi-colored embroidery on front that features a version of the U.S. presidential seal surrounded by the words: "Bill Clinton, 52nd Presidential Inaugural" in white on the outermost ring and the words: January 20, 1993, Washington, D.C.," in red. Interior tag reads: "Whole Systems Design, Inc. Lotron, Virginia, 'Flip Your Lid.'" This hat, which arrived by U.S. mail just yesterday, was graciously loaned to the Project by VLS classmate Fred Zeytoonjian who currently works in our nation's capital (his business card reads: "Manager, State & Local Government Affairs - East" - though I have to confess I don't know what that means - I haven't actually had an IRL conversation with Fred in more than two decades. The note accompanying the hat describes its provenance as follows: "As promised, here's a hat for Project Cubbins. 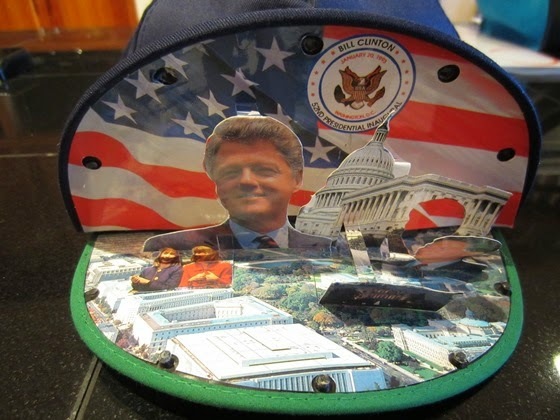 I purchased it in D.C. from a street vendor while attending Clinton's 1st inaugural on 1/20/93." A little trivia about the Seal of the President of the United States of America: You probably know that the dexter (right) talon clutches an olive branch and the sinister (left) holds a bundle of arrows. What you may ot know is that there are precisely 13 arrows clutched in that there sinister talon. The hat-tip to Zeytoonjian, the assist to an unnamed street vendor in our nation's capital and an obligatory honorable mention to POTUS #42. Day 355 / Hat 355: Lime green hard plastic, sticker-covered snowboarding helmet with interior hard foam liner, turquoise-colored chinstrap and and attached zippy pocket earflaps that allow the wearer to crank serious boardin' tunes all the way down the hill. (Where was this stuff when I was hittin' the slopes?). Composition tag reads polyurethane (though I can't honestly determine if that refers to the lining or the shell). Additional interior tag indicates the helmet was manufactured n China in April 2010. Plucked from the MRBOH, this Trace II Audio Snowboard Helmet is by a brand called R.E.D. 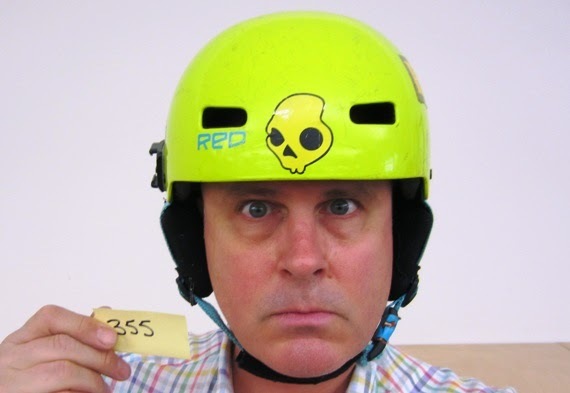 (you can see the logo on the front of the helmet next to the skull) and since I noticed a Burlington, Vermont, mailing address on one of the interior labels I started sleuthing. If my intel is correct*, it's a Burton-owned brand -- or at least the two brands share the same address (80 Industrial Parkway). A funky Friday wired-for-sound helmet? Awesome. An unwitting connection to the 802? That's music to my ears. 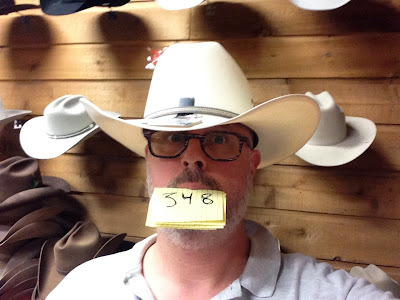 Day 354 / Hat 354: Gold-colored pressed plastic forest ranger's hat with with quadruple-dimpled two-inch crown, one-inch brim and brown felt hatband. Additional detail includes the name "Smokey" printed in dark brown all capital letters across the front. This hat belongs to the stuffed seven-inch-tall (sans hat) Smokey Bear doll that found its way to my desk after I name-checked SB in my coverage of Pharrell William's similar signature headgear. They say that clothes don't make the man but you can see in the photo at far right -- where the hatless bruin is perched unhappily on my shoulder -- he hardy looks the same without it. I probably should have waited until August 9 to wear this tiny cap in honor of everyone's favorite blue-jean-wearing bear but I was worried I'd totally forget. And with the recent wildfires south of here near San Diego, the topic was very much on my mind so I figured that ht should be too. So the hat-tip (and a big bear hug) goes to Smokey Bear with an assist to his parents - the U.S. Forest Service and the Ad Council. I'm sure when he blows out 70 candles later this summer it will be in a totally safe, non-flammable environment. And yes, I'm getting his hat sewed back on properly. Day 353 / Hat 353: White, baseball-style cap with front panel and bill printed with swirling blue, pink and white flowers and Tinker Bell (wearing a strapless green dress). Additional detail includes the word "Tink" in pink embroidery emblazoned with tiny pink crystals. Plucked at random for today's installment of the Project from the MRBOH, methinks this child-sized cap belongs to her darling daughter Ava. "Tinker Bell is both sweet and sassy. She is loyal to her friends and will help fix their problems like a true Tinker Fairy. She loves adding lost things to her collection and going on adventures." Day 352 / Hat 352: Teal-colored wool felt fedora with center dent crown and 1 3/4 inch brim. Additional details include black grosgrain hatband with brown feather, oval, metallic-looking pin with the name "Bailey" on it and brown fabric sweatband lining. Silver printing inside crown reads: "Bailey, est. 1922, LiteFelt, made in the USA, packalble, water repellant." Interior label reads: "Bailey of Hollywood," and interior tag reads: "100% wool, made in USA." Another loaner from The Headwear Association, the hangtag on this lid identifies it as a style called "Tino." I dunno who Tino was but man, he sure inspired one snazzy looking lid. 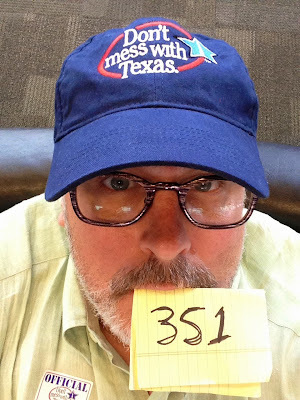 Day 351 / Hat 351: Navy blue, baseball-style cap with embroidery detail on front that reads: "Don"t mess with Texas" in white letters surrounded by a red oval with a blue, five-pointed star logo with white dotted-line design down the center. Interior label reads: "Authentic Head Shots by KC Caps, one size fits most, made in Cambodia, 100% cotton." Purchased (not stealth-snapped!) at the Stars of Austin gift shop at the the Austin-Bergstrom Airport in Austin, Texas, enroute home. And yes, we DID mess with Texas - in the best possible way - during our mini-break in the City of the Eternal Sound Check (there's an aloe vera plant somewhere out there with the battle scars to prove it). While most people have heard the oft-repeated phrase "Don't mess with Texas," most probably aren't aware that its origin is not political but environmental in nature, coined as part of a statewide anti-littering campaign in 1986 and it's a registered trademark of the Texas Department of Transportation. In fact, a sticker on the underside of the brim notes that "a portion of the proceeds from the sales of these products will fund the state's litter prevention program ..."
So you might say that while I messed with Texas, I cleaned up after myself too! 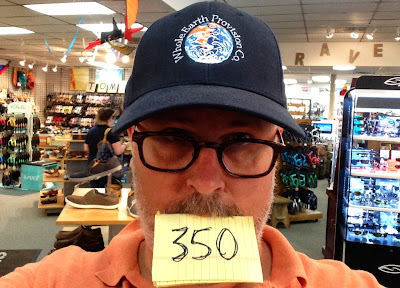 Day 350 / Hat 350: Navy blue, baseball-style cap with embroidery detail on front that includes a multicolored "big blue marble" embroidered depiction of planet Earth along with the words: "Whole Earth Provision Co." in white. Hangtag indicates the "WEPCO logo cap" was made by Dorfman-Pacific Co.
Stealth-snapped at the Whole Earth Provision Co. store at 1014 N. Lamar Blvd. in Austin, Texas. The Whole Earth Catalog was a revolutionary publication that flourished in the 1960s into the early 1980s. The Catalog encouraged “individuals to conduct their own education, find their own inspiration, shape their own environment and share the adventure with whoever is interested.” The Catalog had hundreds of pages filled with short descriptions of books and tools that presented an encyclopedic view of the world and how it worked from the microscopic to the galactic. For an item to be included in the catalog, it had to meet four criteria: useful as a tool, relevant to independent education, high quality and/or low cost and easily available by mail. But what the Catalog’s readers really longed for was a store where they could actually lay their hands on the books and tools they’d been reading about. Jack and Linda Jones, with the help of their friends and family, made that dream a reality by opening a retail store, Whole Earth Provision Co., based on the ideals and products found in the Whole Earth Catalog. The first Whole Earth store opened on December 14, 1970, a block from the University of Texas campus in Austin. It was so successful that the shelves were empty ten days later. The store had an eclectic stock where shoppers could find items like “how-to” and travel books (including the Whole Earth Catalog), grain mills, massage oils, baby carriers, geodesic dome model kits, Aladdin mantle lamps and beekeeping supplies. Gradually, hiking boots and lightweight camping equipment like tents, backpacks and sleeping bags were added to the mix." 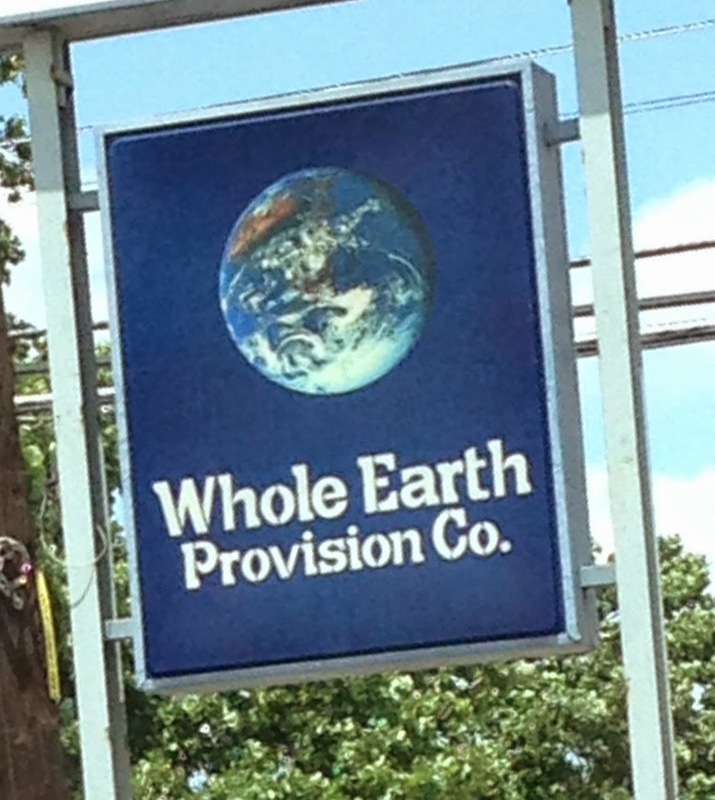 According to its website the Whole Earth Provision Co. now has nine stores in five Texas cities - including three in Austin. Since Austin is where Whole Foods got its start (we also popped into its flagship store today) I can only wonder if the name was somehow inspired by the Whole Earth name (store or catalog). Another bit of trivia? Our friend Dudley DeZonia once worked at the original Whole Earth Catalog, I believe it was from 1969 until its demise in 1971. 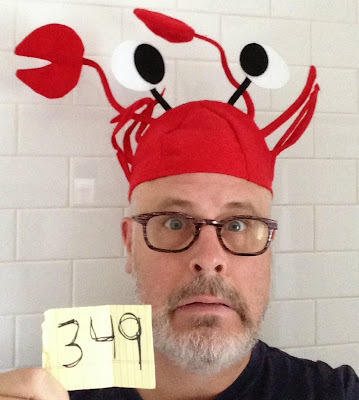 Day 349/ Hat 349: Red felt crab beanie-style hat with black and white eyes and red crab claw details both on bendable things not unlike pipe cleaners. Interior tag reads: "JHats 4/13, made in China," and interior barcode sticker reads: "America! 11265, Crab Hat, $6.99"
Purchased for the Project by my sister-in-law, Kathleen who spotted it in the Baltimore airport during a connection en route to Austin, Texas, to meet the Bride and me. So today's tip o' the crab claw goes to 'Thleen for her discerning eye for headgear - especially in light of the fact that she can't eat crab, lobster and the like 'cause she's allergic. How's that for not being the least bit shellfish? Day 348 / Hat 348: White cowboy hat. gray, two-tone grosgrain hatband includes metal western belt buckle style detail. Hangtag reads George Strait Collection by Resistol. Interior tag describes it as a style called Cole with a 4-inch brim in size 7 1/2. This hat was stealth-snapped at Allens Boots on South Congress Street in Austin this afternoon (yeah, I messed with Texas) but don't feel the least bit bad as the Bride was distracting the sales team by purchasing a pair of Liberty Black, made-in-Mexico, chocolate brown, fringe booties. Despite the name, Allens represents in the hat department too, and for a fee of $5, will shape your hat. I also like Allens because their men's section has a sign above that reads "Man Cave." So today's (unwitting) hat tip goes to Allens Boots. Day 347 / Hat 347: Cream-colored, broad-brimmed sinamay hat with black polka dots and large bow detail. Interior label reads: "C&C Exclusive" and interior tag reads: "100% sinamay, made in China." Photographed on this morning's Southwest Airlines flight from LAX to Austin, this hat fell into my lap - almost literally - as it belongs to my port-side seatmate (the Bride is starboard) a delightful woman by the name of Elspeth Connatty. 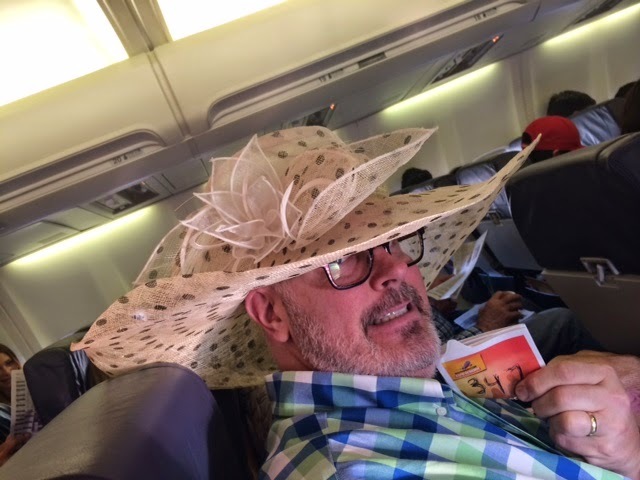 I was able to control my hat-borrowing impulses when she first sat down, but after the Bride pointed out Ms. Connatty had not one but THREE summery, broad-brimmed hats sitting quietly on her lap, it was more than I could bear. When the hat gods speak who am I to not listen? Team Connatty hails from the Bay Area (Richmond, California, to be exact) and Elspeth is a midwife by trade‎ (at UCSF Medical Center). Ms. Connatty even remembers where she purchased the hat - the Berkeley Hat Shop on Telegraph. So today's hat-tip most assuredly goes to Elspeth Connatty for indulging my millinery whimsy.